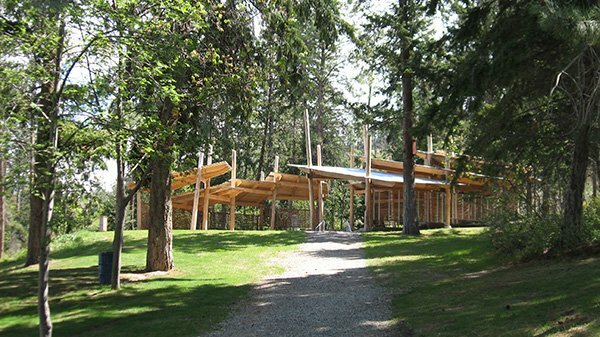 The Okanagan Mountain Fire Pavilion was commissioned for a dual purpose, to educate and to cultivate community. The pavilion serves to illustrate the devastation of the 2003 Okanagan Mountain Fire in order to raise awareness of the impact of the fire, the Mountain Pine Beetle problem and the fragile nature of the woodland setting. Additionally, the Pavilion provides a community gathering area amidst a beautiful natural setting in Bertram Creek Park in Kelowna, British Columbia.